Say, for example, I am looking for “coffee” on Amazon. 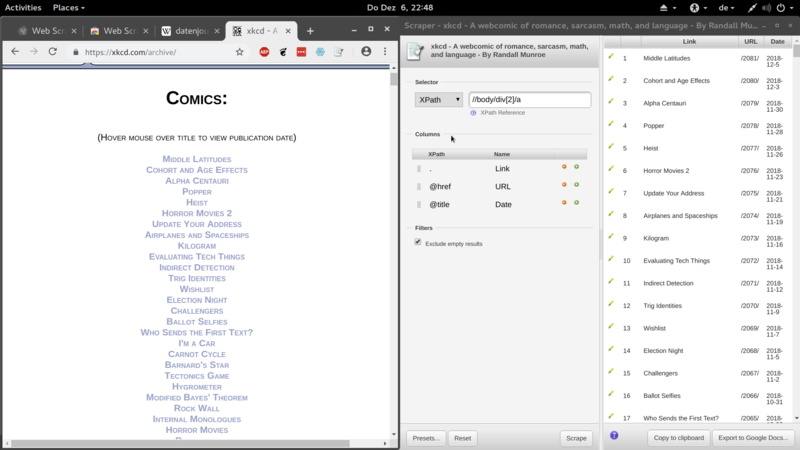 When I hit “search”, I get a list of results that’s made to be easily readable for humans. But it doesn’t help me much if I want to analyze the underlying data – how much the average coffee package costs or which brands dominate the Amazon coffee market, for example. For that purpose, a handy table might be more practical. One option, then, might be to copy the information on each result by hand. Let’s say that takes my unpaid intern — whom I hired because I didn’t want to do the job myself — 5 seconds for each search result. With 200,000 results, that still takes them more than a month, if they work full-time from 9 to 5 at constant speed, without pause. So, even if I had an unpaid intern at hand, this way is just not practical. My main motivation for learning how to code has always been laziness: I hate doing the same boring thing twice, let alone 200,000 times. So, I learned how to scrape data. If you need to scrape many differently structured sites, though, you’ll quickly notice their biggest drawback: scrapers are pretty fragile. They have to be configured for the exact structure of one website. If the structure changes, your scraper might break and not produce the output you expect anymore. This is also what differentiates scrapers from APIs. If you haven’t heard of those before: Application Programming Interfaces are portals that website creators use to grant developers direct access to the structured database where they store their information. They’re much more stable because they’re designed for data extraction, but: The website creator gets to decide the rules by which you can get access. They might limit the scope of data you have access to, or the extraction speed. Scrapers, in contrast, can extract anything you can see on a web page, and even some things you can’t (the ones that are in the website’s source code — we’ll get to that in a second). Also, not nearly every website has an API, but you can scrape info from virtually any site. Scrapers occupy an important place in the scope of data sources available to data journalists. So let’s get to it: how to scrape data yourself. A bit of a damper first: scraping is one of the more advanced ways to gather data. Still, there are some tools you can — and should — start using immediately. Paste the data. Voila — a neatly formatted table. If you’re feeling a little more adventurous, try the Scraper extension for Chrome. It can scrape more than just tables — it scrapes anything you can see on a website, with no programming knowledge necessary. A new window will open and, if you wait a minute, you’ll see that the program has already tried to guess which elements of the web page you want information about. It saw that there are many links like the one you clicked on the site, and thought you might want to scrape all of them. If you know your way around the inner workings of a website a bit, you’ll recognize that the “XPath” field specifies which kinds of elements you want to extract. If you don’t: don’t worry about it for now, this is generated automatically if you click on the right element to scrape. Feel free to try the Scraper extension on any information you want to extract as well as on other elements – it doesn’t just work on links. Once you have the information you want and the table preview looks good, just click “Copy to clipboard” or “Export to Google Docs…” and do some magic with your newly scraped data! Often, the data we want is not presented neatly on one page, but spread out over multiple pages. One very common example of this is a search that only displays a few results at a time. Even with our fancy extensions, this would reduce us to clicking through each results page and scraping them one by one. But we didn’t want to do that anymore, remember? Thankfully, there’s a programming-free solution for this as well. It’s the Web Scraper extension for Chrome. As you’ve probably already realized with the previous extension, you really need to know how websites work to build more complex scrapers. Web Scraper is still pretty interactive and doesn’t require coding, but if you’ve never opened the developer tools in your browser before, it might get confusing pretty quickly. I won’t go into much detail about how this works here – that might be material for its own tutorial – but I do want to show you the basic process. You can see it in the video below. Web Scraper lives in the Developer Tools, so right-click > “Inspect..” and select the “Web Scraper” tab. Click “Sitemap [name]” > “Scrape” and wait until it’s done. Click “Sitemap [name]” > “Export data as CSV”. As you can see, there’s a bunch of options out there for those of you who do not code at all. Still, programming your own scrapers gives you a lot more freedom in the process and helps you get past any limitations to the tools I’ve just introduced. I mostly use the function library rvest do do my scraping with the programming language R, because that’s what I’m most comfortable with. But Python, as well as node (so I’m told) and probably many other programming languages, offer scraping functionalities as well. For a head start in scraping with R or Python head to our tutorial. Some function libraries that help you with scraping, apart from rvest, are Requests, Puppeteer, PhantomJS, Selenium and Scrapy. Try them out and tell us your favorite! I use Selenium for more complex problems. Because there are some situations where even many programming libraries give up. There are some hurdles you might encounter in your work, and I want to go through some common phenomena here to give you a heads-up. Just click on one of the phenomena to get an explanation on how to get around it. Scrapers can only “see” what’s in a website’s source code, so you’ll have to use different methods here. Download the documents, be it images, PDFs or others, you want to analyze, and use appropriate software. If it’s an image or a non-searchable PDF file, you might need an optical character recognition (OCR) software. If the website isn’t consistently structured, your scraper will have a hard time figuring out where the data you want to scrape is located. Try using a pattern recognition algorithm. Regular expressions, for example, might be the way to go. Selenium or similar libraries can help you with this, too — as I said, they can do anything you can do on the web, just automatically. Be careful when scraping content behind a login window, though: Some websites forbid automatic data extraction, and once you create an account and accept their terms of service, you might actually break your contract with them by doing it anyway. Some pages try to detect unusual traffic. If you scrape a lot of pages really quickly, they might block your IP to protect themselves from attacks or to prevent you from extracting data. There are services that offer IP rotation: They automatically change your IP every X seconds. A VPN might also be helpful. Still, once you encounter that barrier, maybe check with your legal department whether your scraping is still on the legal site. You know those. They’re supposed to make sure the people using a site are actual humans. And your scraper might be one of the non-people they’re trying to keep out. This is a tricky problem. You might think about entering the Captchas by hand as your scraper encounters them or, if you don’t want to do that and you really need what’s behind that “no robots” sign, you might ask a proper nerd for help. Happy scraping, and don’t panic! Don’t worry, though: Most of the situations you’ll encounter won’t require heavy-duty scrapers. As you can see, there’s a bunch of options out there for those of you who do not code at all. Programming your own scrapers gives you even more freedom in the process and helps you get past any limitations to the tools I’ve just introduced. 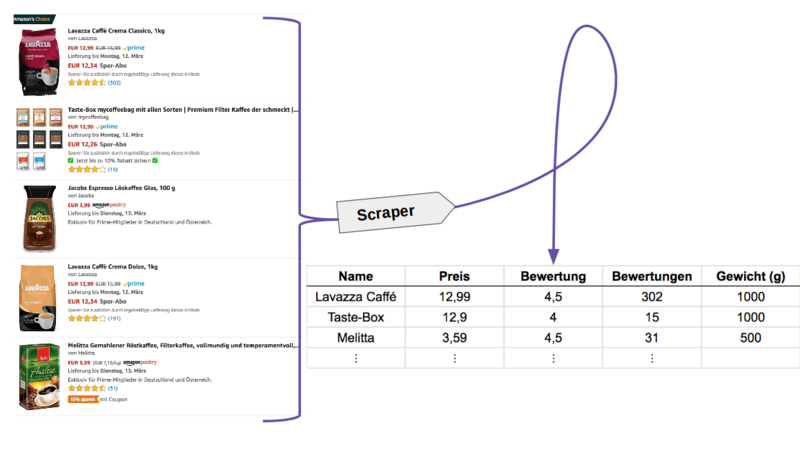 Still: if you know how to extract a table, and maybe even how to use the Scraper extension: awesome! You already know more than 99 percent of the population. And that fact is definitely true — we’re data journalists, after all. We hope this tutorial-slash-toolkit-overview has provided you with a good starting point for your scraping endeavours. Thanks for reading, and happy scraping!